This sophisticated cocktail is gorgeous, simple to make, and a perfect way to kick off your holiday celebrations. Pair a glass with chocolate pancakes on Christmas morning! *Net carbs assist you in tracking carbohydrates that impact blood sugars. Dietary fiber and SOLA sweetener should be subtracted from total carbohydrates since they minimally impact blood sugar. Divide the raspberry purée and vodka into 4 chilled champagne glasses and mix well. Pour a small amount of Prosecco into each glass and stir well. It will fizz up and bubble wildly, so pour very slowly. Carefully top up the rest of the glass with Prosecco and stir very gently, being careful not to let it overflow. 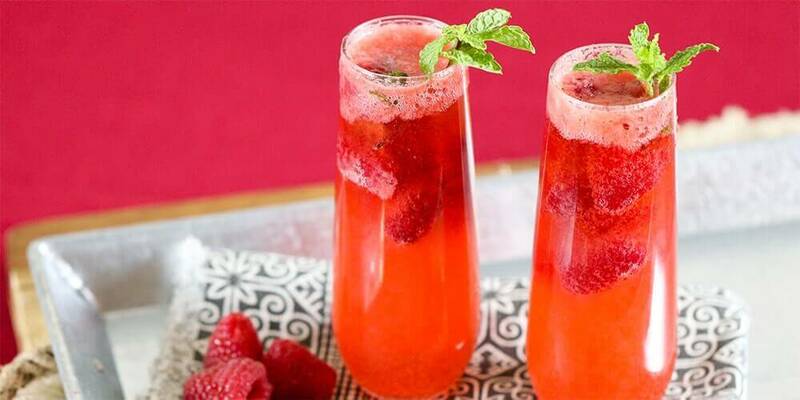 Place a fresh raspberry and a sprig of mint into each glass and serve immediately. To make the raspberry purée: place ¼-cup (70 g) fresh raspberries and the Sola® into a blender and pulse until the berries are macerated. Transfer to a sieve held over a mixing bowl, and use a metal spoon to push the raspberries through, releasing the juices but keeping the seeds separate. Vodka can be replaced with Brandy for an equally delicious result. Today's food industry has made it extremely difficult to avoid sugar. Grocery stores are filled with processed foods packed with large amounts of added sugar and processed carbohydrates. It's why obesity and chronic disease are at epidemic levels - and why we make our incredibly delicious, better-for-you products without all the sugar and low net carbs. At SOLA, our purpose is to offer healthier alternatives for every taste, without losing any of the deliciousness and flavor you're accustomed to. We want SOLA to be the delicious choice for your healthier lifestyle. The SOLA Company is launching an entire range of exciting low-carb, low glycemic, delicious food products including bread, ice cream, granola, nut bars and our patent pending sweetener. To find out more about our products please read our FAQs, and use our Store Finder to see if our SOLA products are near you. Solicitations received through this form will be marked as spam. Offer excludes icecream. Coupon must be applied at checkout.